Proof of Purchase: Why Smoked Meat Lovers are Using ThermoPro TP11? Nice rating is one indicator of quality service which should never be ignored. This backed up by awesome reviews means that indeed the product has won consumer confidence in the recent past. For this TP11 model, we are delighted to recommend it to you. We believe that a 4.3 stars rating provides a valid ground for your purchase. Another reason why you should consider ThermoPro for a probe thermometer is the cost-effective nature. The price is simply a great bargain and a source of discount to you. Budgeting for this model won’t dig deeper into your budget. Additionally, the product is genuine and in arguably high quality product. This is because it is recommended by USDA which is a reputable approval body. Any product that wins the confidence of USDA is worth your money, because you’re sure of your money back service. Life time probe sensor warranty is an additional incentive that shows how caring the brand is. We acknowledge the fact that the probe sensor is rigidly produced. However, due to the continued use and overuse, it weakens and wears out. Consequently, functionality reduces and in case this happens, you are entitled to a new replacement. 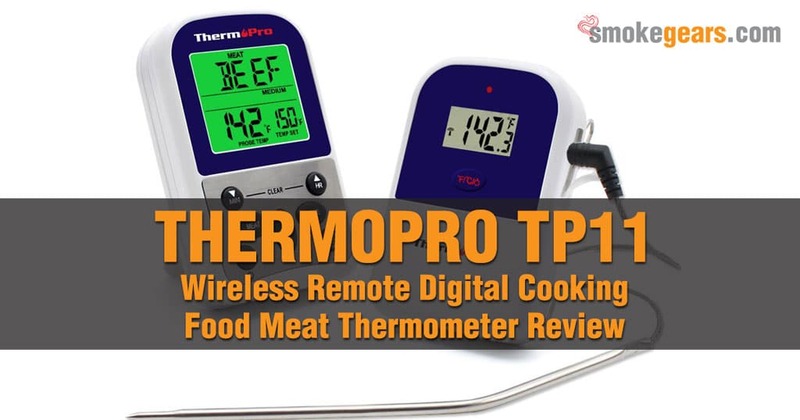 This is why we strongly recommend purchasing ThermoPro TP11 Wireless Remote Digital Cooking Food Meat Thermometer. Has a remote range of up to 300 feet. Mesh cable material is stainless steel. Probe certifications include FDA, FCC, CE and ROHS. Uses: BBQ, Oven, Smoker, Candy, Meat, Food. Probe and Wire can withstand up to 716˚F (380˚C). Product dimensions: 6.4 x 2.5 x 5.9 inches. Upon purchasing your probe thermometer from ThermoPro, you will find a range of accessories right from the transmitter to the receiver. The probe thermometer itself comprises several features designed with convenience as the ultimate goal. Now your task will be uncovering every detail about this equipment and experiencing the best results you desire and deserve. Basically, you should expect features such as the backlit screen, remote range of up to 300 feet and so on. In this regard, you are no longer a slave in your own kitchen having to watch over your cooking or grilling food. You can walk around and enjoy your company without losing the accuracy of your BBQ. Even if it is at night, the backlit screen allows you to read your cooking temperature with clarity and accuracy. The screen changes color during the process of cooking or smoking from be to green to red. As already mentioned earlier, ThermoPro TP11 is USDA approved. This implies that all the pre-set temperatures for meat and game meat are accurate. Besides, it also allows you to manage you temperature manually. Therefore, your needs as far as temperature settings are completely solved as long as you purchase this great equipment. Last but not least, this probe thermometer is certified by four different bodies which include FDA, FCC, CE and ROHS. All these certifications were done after testing and confirming the quality of this meat thermometer. As a prospective consumer, you have every reason to defend your decision of purchasing this equipment. Who is the ThermoPro TP11 for? This product is for anyone wishing to transform his/her cooking, smoking or BBQ experience within the shortest time possible. If the internal food thermometer of your smoker is no longer functional, TP11 provides a good start-off for you. Beginners also find this unit a great way to enhance cooking or grilling accuracy. It is so easy to use, as long as you assemble and synchronize the receiver and the transmitter. Because it is a cost-effective probe thermometer, upcoming restaurant business owners can also start off from here. It does ensure great cooking, grilling and smoking outcomes without compromising your profits. First, we all know that for a reputable body like USDA to recommend a product, there must be valid grounds. As a user, this certification is the advocate of quality service you expect. Certifications listed in this review are more than enough proof that this product will never ever let you down. Secondly, the soundness of this probe thermometer is in its high rating and reviewed. Backed up by our interviews to previous consumers, we believe that this product is several miles away from scams. USDA approved thus highly trusted. Available at a cost-effective price. More digital and efficient backlit screen. More certifications than any other probe thermometer which portrays its quality service. Highly rated and positively reviewed. Made of stainless steel which is a high quality material. Long enough food grade stainless steel probe promises great results. Lifetime sensor probe sensor warranty assures long-lived service. Alternating colors of the backlit screen increases user convenience. Smaller screen compared to other models. However, this does not compromise efficiency. Probe sensor warranty is an incentive to the user. Transmitter and receiver has to be synchronized before using. Has a single wireless probe. The ThermoPro TP-11 digital wireless meat thermometer features all-round features with your needs fully catered for. It has full potential to transform your cooking and BBQ experience with every single feature customized to fit you. The probe thermometer is simple and easy to use yet great in bringing about desired results. The range of 300 feet allows you to accurately and remotely monitor your food without any hassle. For beginners, this is a good way to start your cooking and grilling journey. Restaurant owners can also buy this equipment at cost-effective price and still will as much as they do with other similar gadgets. Certifications, approvals and recommendations by highly reputable bodies manifest quality service. Therefore, as you plan to have a smoker thermometer, ensure you plan for ThermoPro TP-11 digital wireless meat thermometer. Once you have this model your kitchen experience shall never remain the same.